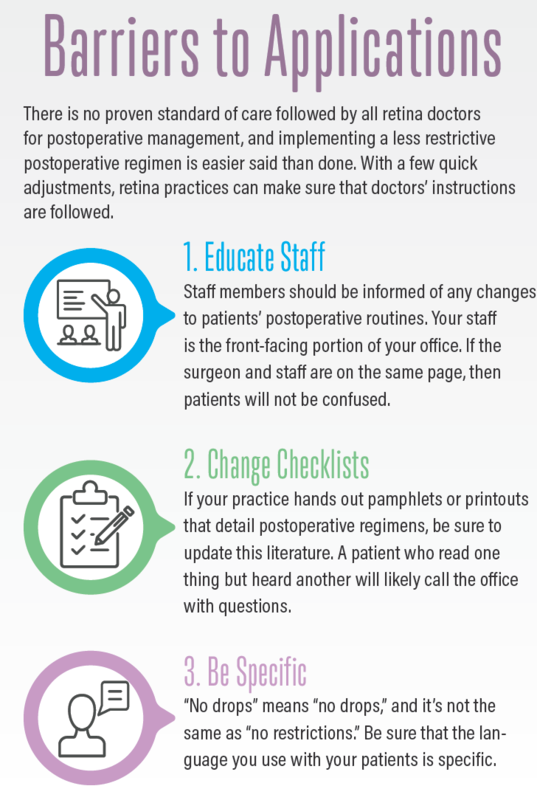 Some retina surgeons recommend postoperative regimens from an older era. It may be time for a change. 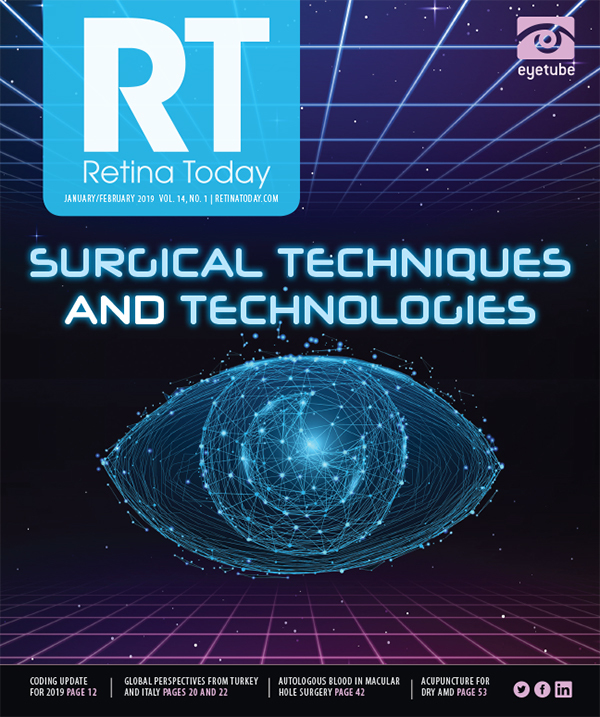 This issue of Retina Today is a celebration of new technologies in the OR and the techniques surgeons are now equipped to perform more precisely and efficiently than ever. Innovation is a life force in retina, and the improved efficiencies and reduced risks related to surgery in 2019 are to be applauded. A detailed review of techniques and technologies without consideration of how they speak to trends in ophthalmology would be myopic. Retina Today invited Peter Karth, MD, MBA, to provide a macro-level understanding of how the innovations retina surgeons encounter today are part of larger trends in improved patient outcomes and postoperative care. Retina specialists consider themselves distinct from other ophthalmologists—and rightly so. The pathologies we encounter and the surgeries we perform daily are different from those of our anterior segment colleagues. The ways we have been taught to think about surgery are significantly different. • Postoperative regimens from the era of 20-gauge surgery are often still followed, but the era of 27-gauge surgery is here. • There is no evidence to support claims that significant postoperative restrictions on movement result in better outcomes with routine 27-gauge surgery. • Patients can have a significantly improved postoperative experience and cost savings if their postoperative obligations can be reduced or eliminated. This does not mean that we cannot learn from each other, though. One area in which anterior segment surgeons—particularly cataract and refractive surgeons—have excelled is in improving the patient experience. Refractive surgery patients often see well postoperatively within 1 or 2 days; cataract patients often see well within a few hours. So-called dropless cataract surgery has eliminated costly drugs and frustrating routines. The lack of restrictions following surgery means that most patients can get back to their normal lives by the time they get home and that patients are more likely to undergo beneficial surgery due to easier postoperative regimens and less hassle. Cataract and refractive surgeries, once procedures with arduous postoperative regimens, have become routine. With the large leaps forward in surgical technology we currently see, retina surgery has the opportunity to safely reduce postoperative burdens (such as costs and inconvenience) on our patients and in some ways become similar to anterior segment surgery. At this point in the progression of our field, we must take a hard look and ask ourselves this question: In light of current advances, do our postoperative regimens match our modern operative techniques? The introduction of 27-gauge surgery is the most significant leap forward in our field in the past several years. The documented surgical benefits for patients and surgeons, which have been well described, are important to consider when weighing the benefits of moving to a 27-gauge platform. Still, the benefits a 27-gauge platform can offer regarding the patient’s postoperative regimen are often ignored. We must think about the full surgical experience when we consider a new platform’s consequences. An important part of that experience—and one that is easy to forget about because it is not in front of us—is the postoperative patient experience, which includes follow-up visits, movement restrictions, and eye drop application. I think it is worth asking ourselves if our current postoperative regimen for uncomplicated cases is all that different from the regimens used 8 to 10 years ago. For my patients, I recommend no restrictions whatsoever in approximately 85% of cases, and tell patients they may resume all normal activities the next morning. For patients with macular holes, I have had great success with only 4 to 6 hours of facedown positioning immediately after surgery; I instruct patients to read a book or use their smartphone during that time. For retinal detachment patients, I advise a few days of lying on the appropriate side, usually with no facedown positioning at all. I instruct patients to take off their eye patch the morning after surgery and not to wear it ever again. For patients who underwent surgery for anything other than a retinal detachment, I tell them that they should resume all normal activities that day. There are no restrictions whatsoever. Bending, lifting, and makeup wearing may all occur as they did before surgery, starting the morning after surgery. This is thanks, in large part, to the benefits of 27-gauge surgery and to a change in mindset that came with it after a critical assessment of the consequences of smaller-gauge surgery. Much of what retina surgeons instruct following surgery is a holdover from the days of 20-gauge surgery. Given that techniques for, say, internal limiting membrane peel have evolved significantly from the days of 20-gauge surgery, why shouldn’t our postoperative recommendations? Many of the postoperative instructions we advocate made sense at a time when surgical incisions were sutured and less precise instruments were more disruptive to ocular structures, resulting in dramatically more occurrences of surgical complications. Given today’s self-sealing wounds, precision instruments, and a lack of evidence to support that old-school postoperative instructions actually result in better patient outcomes, I believe that highly restrictive postoperative regimens are largely outdated, unnecessary, and not evidence-based. They also unnecessarily increase the patient burden of our surgeries. I have had many patients agree to needed surgeries after I explained the simplicity of their postoperative regimen. In my experience, IOP levels return to normal within a few hours after 27-gauge surgery. In my practice, same-day postoperative examinations are often performed for patients who have traveled long distances, and we are considering adopting this schedule for nearly all patients. This saves an additional trip to my office for patients and caregivers—an important, rather than a trivial, concern. We are exploring no longer prescribing postoperative antibiotic drops for patients who have undergone 27-gauge surgery. There is no clear evidence linking postoperative drop use with adverse outcomes in patients who undergo retina surgery, and there is less theoretical benefit to drop use following 27-gauge surgery. Patients save significant amounts of money by not having to fill drop prescriptions. This financial cost is an important one, as typical drops may cost a few hundred dollars, which can be significant to patients on fixed incomes. Furthermore, many older patients have difficulty with drops and may need a caregiver to administer them. I have found that patients are very pleased with a dropless regimen. At my practice, we are conducting a study to look at this issue and have had encouraging results so far. We retina specialists often think about treatment burden vis-à-vis anti-VEGF therapy. We know that the burdens of medical retina therapy are many—routine trips to a clinic, time off from work, the obligations of caregivers, etc.—and yet we sometimes forget that the burdens of surgery can be similarly disruptive. Imposing less restrictive postoperative obligations can improve the patient experience and reduce costs, and the possibility of reducing the number of follow-up visits can improve practice efficiency. While we must proceed carefully with these types of changes and look for evidence to support improvements, I feel it is important to evaluate and study this area of surgery from both a safety and a patient-satisfaction point of view. We use 27-gauge surgery to improve the precision and quality of surgery. Now let’s think of how 27-gauge surgery can improve our patients’ quality of life.